Half A World Passed Me By also includes figurative works, studies and sketches, and Walker will introduce a series of text-based paintings featuring his own writing. The show title ‘Half A World Passed Me By’ contains various personal references, in keeping with this new body of work. WaIker explains: “I have been completely blind in my right eye since birth. It’s not common knowledge as I didn’t want it to be used it as a USP for my work. I also turned 40 last year, coinciding with one of the most difficult periods in my life for many reasons. In the aftermath I feel far more fearless as a person and artist and far more comfortable to invite people further into my world. Half A World Passed Me By is made up of around 25 works, featuring male and female portraits, figurate paintings, form and flora and poetic texts. The pieces range from 25cm x 25cm up to 160cm x 220cm and have been created using a mix of spray paint, acrylic, ink and embroidery. The show is split over two levels at Lawrence Alkin Gallery, the top floor focusing on portrait and figurative work and the downstairs showcasing new text based work, portrait studies and collaborations. Walker’s last London show was in November 2014 at the Hoxton Arches in conjunction with Lawrence Alkin Gallery and was a sell-out show. Since then, Walker has been busy painting large-scale murals on streets in France, Denmark, Belgium and New York. He also recently created pieces for the Street Art Museum in Amsterdam and the just-opened Urban Nation Museum for urban contemporary art in Berlin. 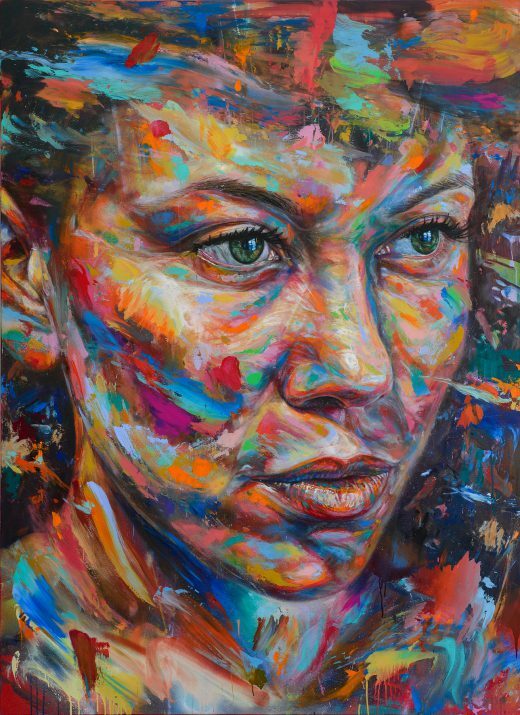 David Walker is a London-born, contemporary portrait artist. Known for his unique multi layered style that fuses Graffiti and Street art sensibilities and techniques with classical portraiture. Over the last 10 years David’s work has been seen internationally both on canvas and within the gallery confines as well as large-scale explosive murals up to 25m high.